This past Sunday, Wu Han and artists from The Chamber Music Society of Lincoln Center performed as part of the PBS’s Live From Lincoln Center. The performance was part of CMS’s Brahms/Beethoven Manifest Legacy festival and featured the Brahms B Major Sextet as well as Beethoven’s “Archduke” Trio. This past Sunday, The Chamber Music Society of Lincoln Center participated in their second Live From Lincoln Center broadcast of the season. I was thrilled to be participating in this nationally televised event with several of my dear CMS colleagues. This was a remarkable occasion for the Chamber Music Society and a testament to the prominent role great chamber music plays in the artistic fabric of America. On the program was Beethoven’s seminal “Archduke” Trio as well the utterly Romantic and lyrical B Major Sextet by Johannes Brahms. The concert was part of the Chamber Music Society’s Manifest Legacy, a winter festival that is exploring how courageously Brahms received the mantle of Beethoven, pairing striking parallels in their repertoire. All the musicians performing on the concert were palpably thrilled to be part of such an event, and each one performed with a kind of energy and enthusiasm that was infectious. 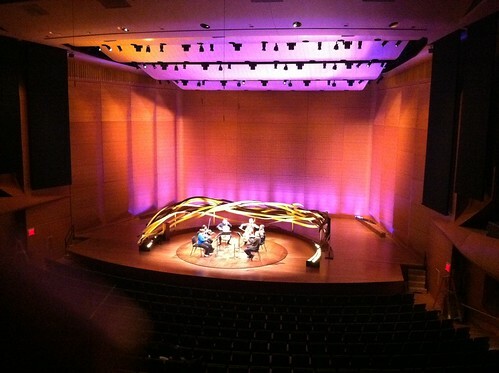 The PBS crew and the Live From Lincoln Center staff did an incredible job transforming the stage of Alice Tully Hall into a beautiful ‘set’, so to speak. This Live From Lincoln Center broadcast is just one of many ways in which CMS is making strides and becoming an industry leader in using new media. This coming Thursday, CMS will be hosting a Late Night Rose Studio concert that will be streamed live through CMS’s website and mobile apps. The last time CMS did a live stream, people from over twelve countries tuned in through the internet or their mobile phones to watch and listen to the performance. The fact that this technology can be used to reach such a broad constituency confirms to us the importance of embracing these new ways to reach new audiences. I am excited about the prospect of bringing great chamber music to more and more people throughout the world using these technologies and am so proud of CMS for being visionary leaders in this mission. Be sure to check your local PBS listings for further rebroadcasts of Sunday’s Live From Lincoln Center program and check out the CMS website for more information on all of their exciting activities. This past week, Wu Han and artists of the Chamber Music Society of Lincoln Center traveled to Provo, Utah; Vancouver, BC; and Chattanooga, Tennessee embodying the spirit of the post office motto: “Neither snow nor rain nor heat nor gloom…” Read about their epic journeys, battling the elements. 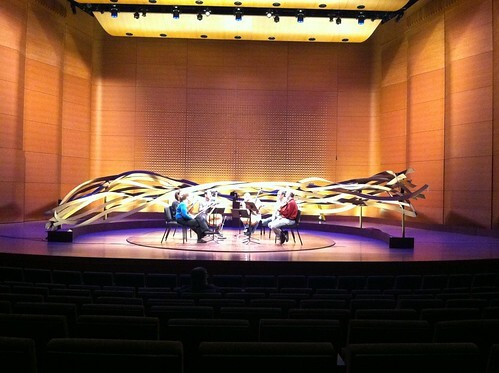 Over the past two weeks, the Chamber Music Society of Lincoln Center has been touring with a program featuring works by Beethoven, Jalbert, and Brahms. We began the tour with a performance in Provo, Utah at Brigham Young University. 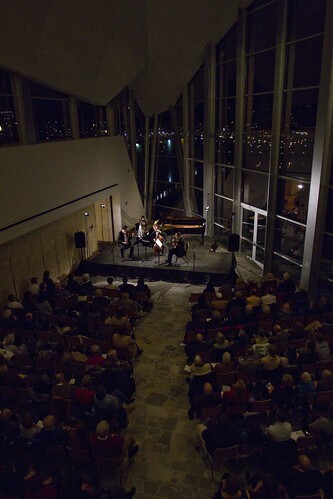 We continued on to Vancouver, British Columbia to perform on the Vancouver Friends of Chamber Music series. In both Vancouver and Provo, we were thrilled to perform for such enthusiastic and warm audiences. 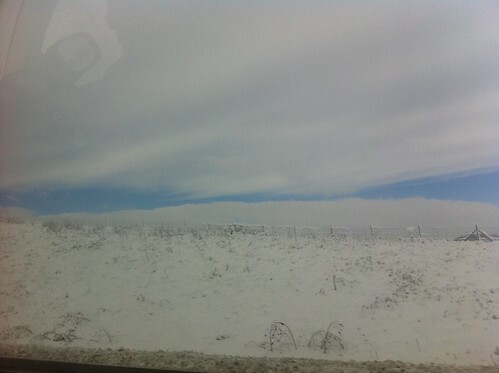 After flying back to New York for a couple of days, we were supposed to resume the tour in Tennessee. As you will read, that trip turned into a journey of epic proportions. This past Wednesday, with the ‘snowpalyptic’ storm bearing down on the East Coast, I was in rehearsal with my CMS colleagues rehearsing and preparing to fly out the next morning for a performance in Chattanooga, Tennessee. During a rehearsal break, we decided to check the status of our flights out of New York City the next morning and quickly learned that they had been canceled. After calling the travel agent, the fact dawned on us that we would not be able to depart New York on any flight due to the inclement weather. We were determined, however, since the concert in Chattanooga, Tennessee was very meaningful to the Chamber Music Society and me. Just a few years ago, Gloria Chien, an enterprising Music@Menlo alumna and first-rate pianist, began presenting concerts at the Hunter Museum of Art in Chattanooga entitled: String Theory at the Hunter. This ambitious series, created from scratch by Gloria, has become a model in the world of presenting great chamber music at the highest level. Though several CMS artists had performed on the series, this was the first time the Chamber Music Society was to make an official appearance. When we learned our morning flight out of New York was canceled, we immediately began exploring other options. The only viable alternative was to catch a train from New York City to Baltimore Wednesday evening and fly out of Baltimore the next morning. My colleagues and I ran to our homes, quickly packed and met at Penn Station for the train trip to Baltimore. Halfway to Baltimore, I received a call from my extraordinary travel agent, Diana Hardy, and learned that the flight we were booked on out of Baltimore Thursday morning was now canceled too! Upon arrival in Baltimore, we immediately went to Washington D.C. to try our luck getting a flight out of Dulles or Reagan National—unfortunately, both airports were near closure due to the storm. Stranded in Union Station, our friend Kathe Williamson generously opened her home in Georgetown to my colleagues and me. There, we were able to get five hours of sleep and be back at Reagan National when the car rental companies opened at 6 am on Thursday morning. 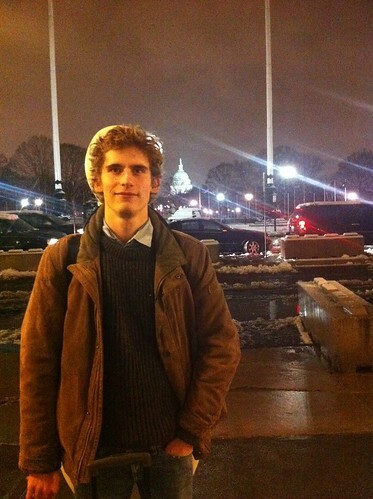 Danish cellist Andreas Brantelid in front of the United States Capitol for the first time. We rented a van, piled in, and braced ourselves for the icy and treacherous drive from Washington, DC to Chattanooga, TN. 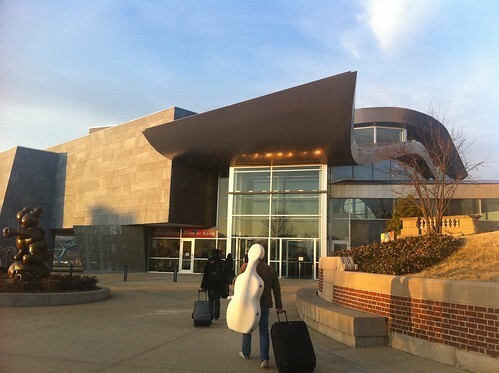 After eleven and a half hours on the road, we arrived at the Hunter Museum of Art in Chattanooga, fifteen minutes before the performance was to start! It was such a joy to walk in and discover a packed house, full of eager chamber music enthusiasts. The warm welcome by the Chattanooga community was heart-warming and confirmed to us that these travel travails had been more than worth it. 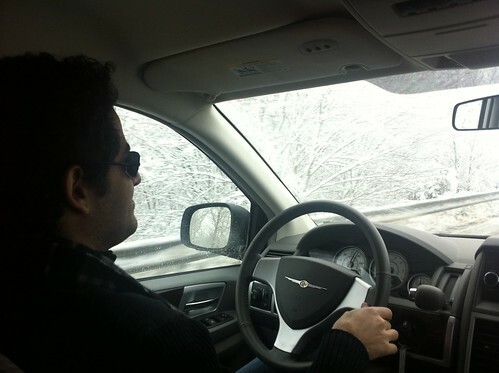 Violinist Arnaud Sussmann takes a turn driving. 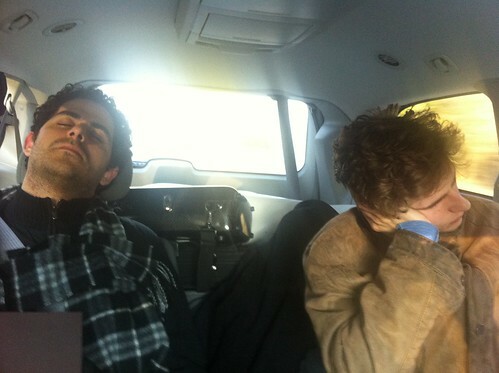 Arnaud and Andreas take a nap along the way. 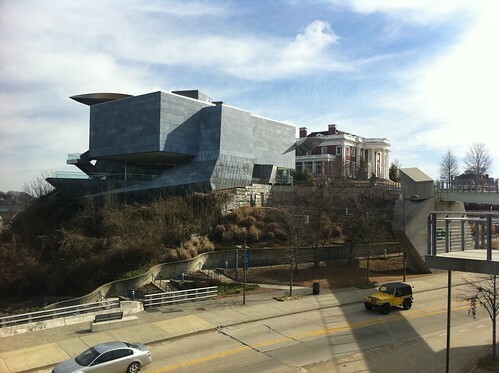 Arriving in the nick of time at the Hunter Museum of Art in Chattanooga, TN. To make a series like this happen, it takes a committed and visionary presenter, a supportive community, and the collective will, dedication, and belief in the power of great music. Chattanooga is certainly lucky beyond measure to have this jewel of an organization. I would like to thank Gloria for her visionary leadership and for granting CMS the honor of performing on this series. I would also like to thank my musical colleagues: violinist Arnaud Sussmann, cellist Andreas Brantelid, and violist Mark Holloway. Each one performed with the utmost dedication, remarkable professionalism and proved to be delightful travel companions! This trip would not have been a success without the support and logistical acumen of the Chamber Music Society of Lincoln Center staff–thank you! And finally, a special thanks to Kathe Williamson for opening up her home in Washington D.C. and to my travel agent, Diana Hardy for her incredibly hard work.